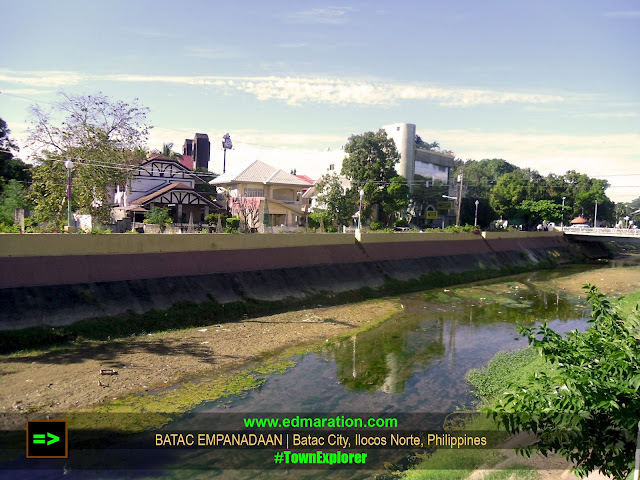 Home All Batac FOOD TRIP Happy Posts Ilocos (Region 1) Ilocos Norte Luzon Philippines [Batac] ► Batac Empanada: So What Makes it Special? 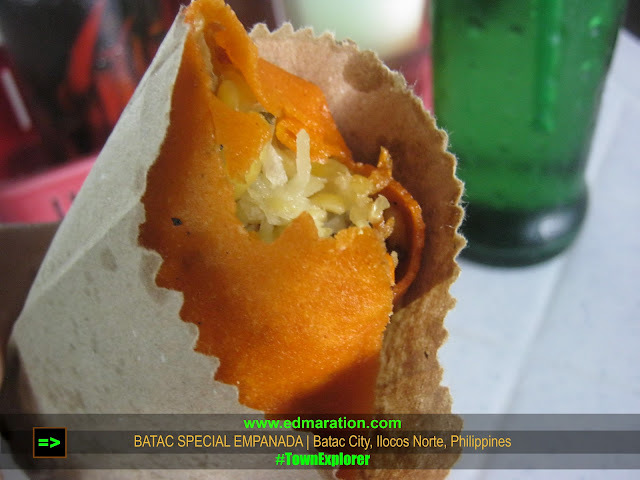 [Batac] ► Batac Empanada: So What Makes it Special? "I have to say that I was so tired and had no breakfast at all but this 30-peso empanada gave me the energy." 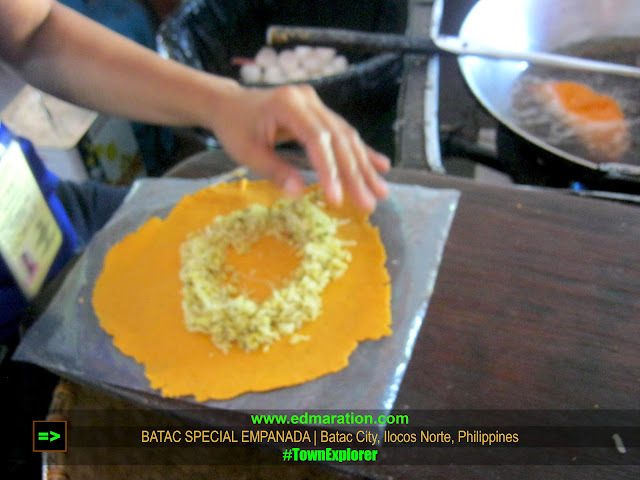 A visit in the city of Batac in the province of Ilocos Norte is not complete without tasting their version of Empanada. 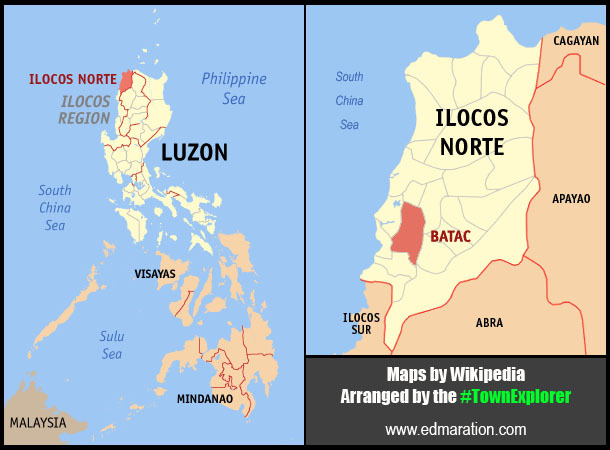 In fact, several cities and towns in Ilocos provinces have their own version of empanada. Each version is undeniably delicious but this time, let's give the limelight to Batac Empanada. To tell you, this empanada served as my lunch during a walking tour in Batac. I have to say that I was so tired and had no breakfast at all but this 30-peso empanada gave me the energy. Some might think that I am just fabricating a story but this is true. The reason why this served as my lunch is because I ran out of money and I have to budget it so that I can still go home without walking, LOL! And it was a good choice for a 30-peso budget for lunch. 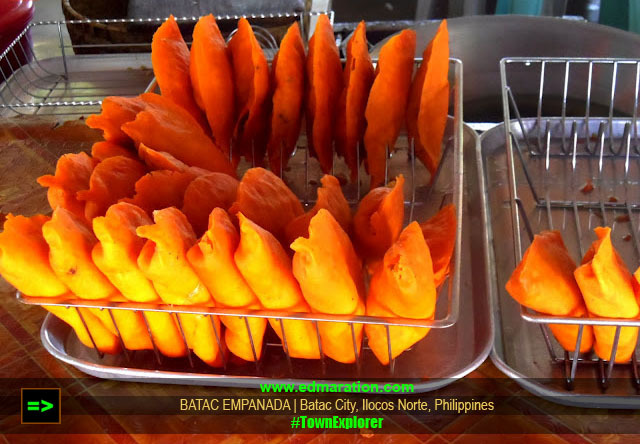 You might notice that Batac Empanada looks bright and inviting because of its orange color. Would you believe me if I'll say that the food color used in this empanada is all natural? Atsuete (atchuete)! That is the name of the natural food color. That plant bears reddish fruits (closely similar to rambutan). Inside the fruit are seeds that have a concentrated dark orange to red pigment. 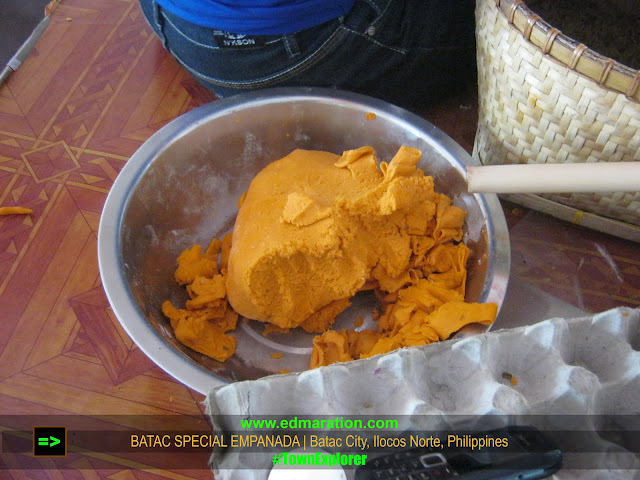 That natural pigment is then extracted to give Batac Empanada that bright inviting color! SO WHERE TO EAT BATAC EMPANADA? Now let me tell you where to eat this famed Batac Empanada. 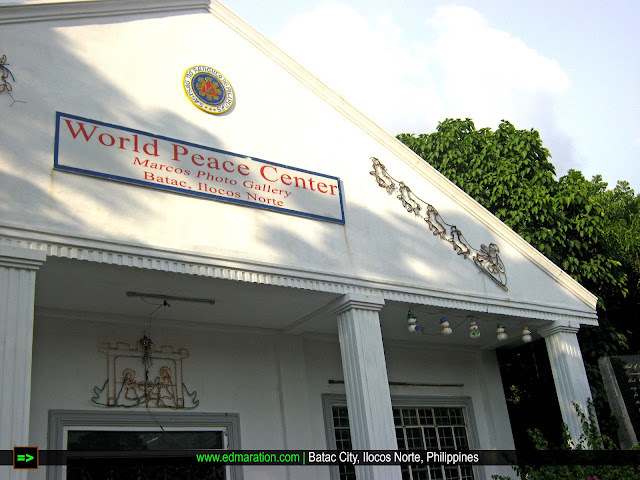 The local government has constructed a food court where Batac Empanada is served. Note, there are several stalls in that food court but the most famous of them is the Glory's Empanada. 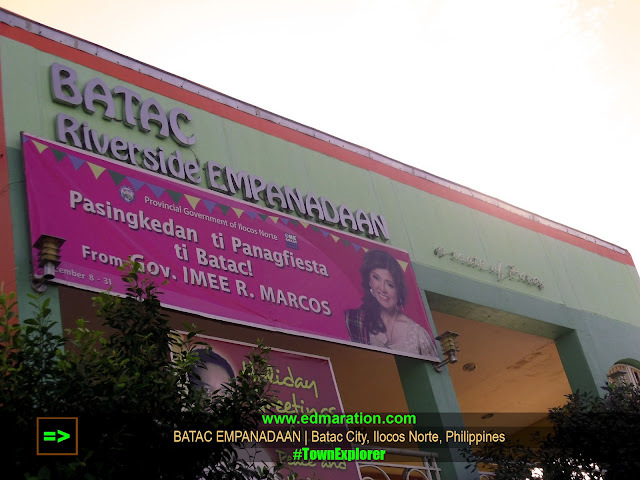 It is officially called as the Batac Riverside Empanadaan. 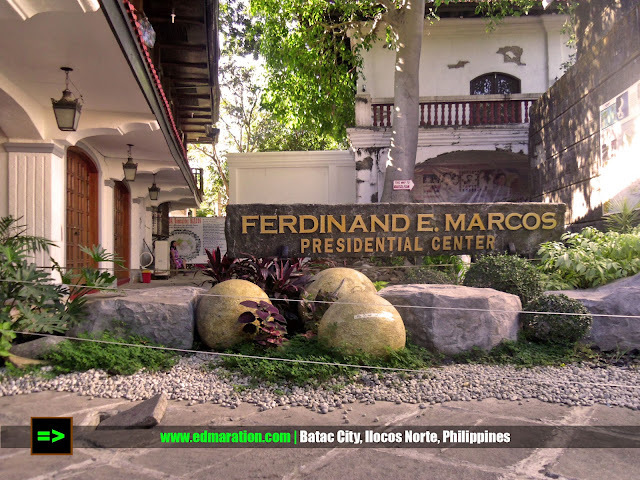 It is accessible and located within the center of the city close to the Batac Church, Marcos Museum and few meters from the city hall and Ricarte Shrine and Museum. 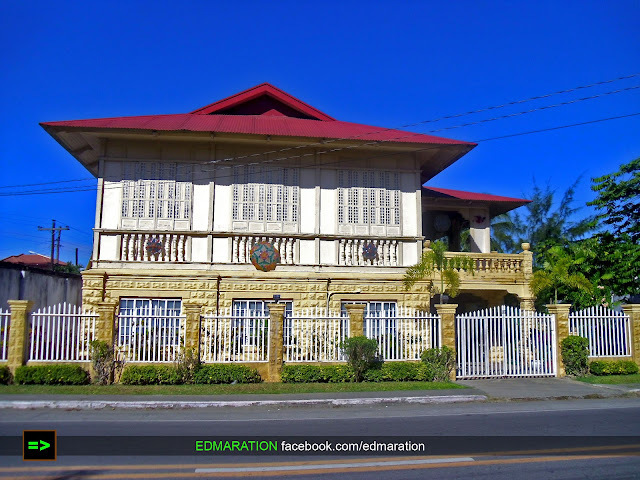 As the name implies, it is located along the river, thus Batac Riverside Empanadaan. What makes Batac Empanada interesting is that it has a lot of variations. There you have to choose what variety you want to eat. Each variety has different price from others. Now let us see where is the river? Uh! There you see it. Ayun ang river oh! 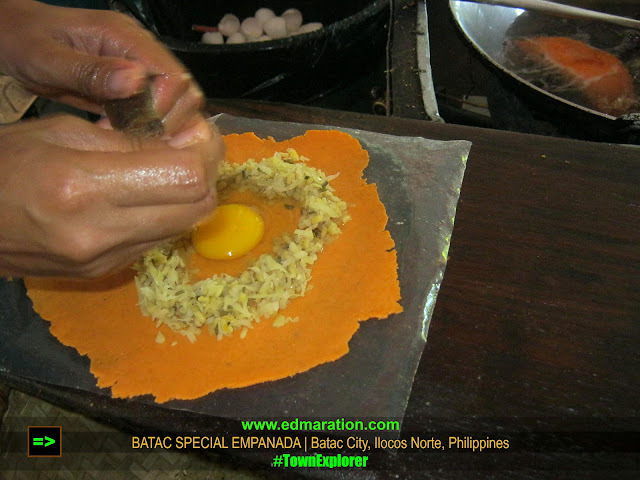 HOW TO MAKE THE BATAC EMPANADA? I am not an expert in terms of making Batac Empanada. But I will show a series of photographs on how the locals make an empanada. I hope these photos will give you the idea. I won't be telling you the whole process in detail because I personally do not know how to make one but I have taken several photos on how they make Batac Empanada, and the process here is the same with other empanada makers from the rest of Ilocos. The first process is of course preparing for the crust. The crust is usually made up of flour (Tagalog: Harina; Ilocano: Arrina or Arrena). But in some versions like the Vigan Empanada, some innovations have been made. So they use pure ground rice for the crust making it crispy and closer to Filipino palate. For the crust, they take a piece from that processed flour and a rolling material (e.g. bottle, PVC pipe) is then rolled over to flatten it like a wrapper for lumpia. After the crust-wrapper has been flatenned, a ring of vegetables is set on it. Batac Empanada is usually made up of papaya and bean sprout. So why there is a space at the middle since this is not a doughnut? (LOL) Ok, that space is reserved for the longanisa and the egg. The empanada maker has placed the egg and on her hands is the longanisa ready to be mixed with the egg. After placing all the ingredients, the crust-wrapper will now be folded to contain the filling. That's how they fold it and a plate is being rolled at the edge to cut the empanada and to turn it in shape. 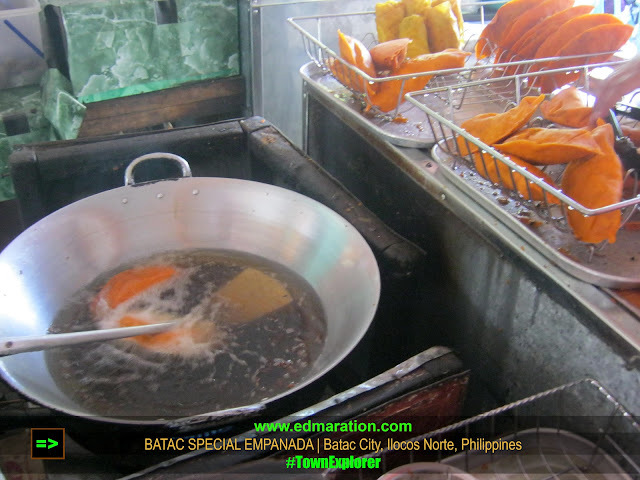 Then the Batac Empanada is ready to be cooked on a boiling oil! The Empanada will stay there for about 10-15 minutes. After it, that'll be ready to eat. 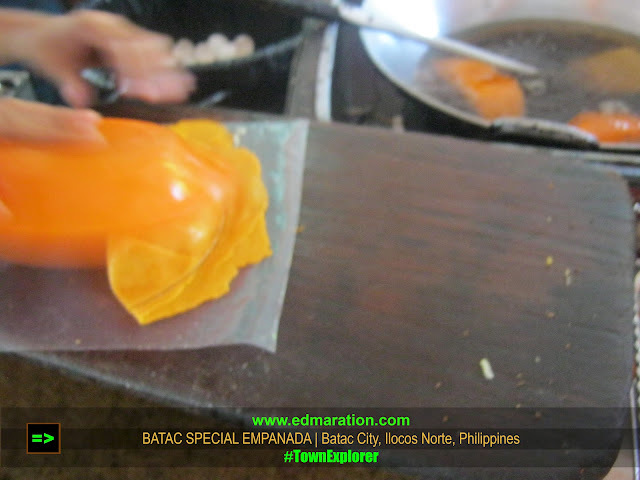 Final Thoughts: So What Makes Batac Empanada Special? I asked one of the owners of a stall at the Batac Empanadaan if what makes their version different from others. She has given me some good reasons. 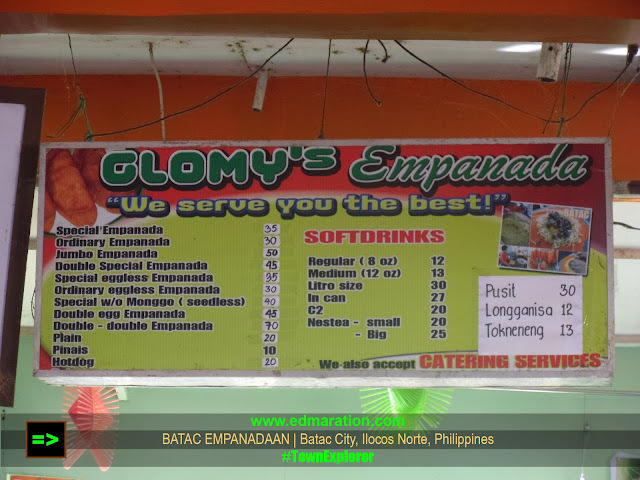 First, what makes their Batac Empanada different from others is that they (Glory's Empanada) manufacture their own longanisa unlike others, they buy from third-party traders. What else? She also mentioned that the orange-y color of the empanada gives Batac Empanada a distinct appeal, although empanada from Laoag and Sinait also have the same color. At eto ang malupet, these empanadas are now being tasted abroad. They are already exporting this empanada overseas where a big Ilocano population is present (like in Hawaii). How about you? Have you tasted Batac Empanada? What makes it special to you? Haha,, oo ba Mica Sure! Just tell me ahead of time para maka-prepare ng free time, haha. is there VEGAN version without meat or eggs? it looks good, but i prefer vegan. I was craving for special empanada and when i opened my email tsk tsk tsk yung post mo ang lumabas ginugutom tuloy ako.. I miss na the Batac Empanada!!!! :) Sana nagTravel tayo together noh? Dbale, next time ulit! Just had a taste of Ilocos empanada last night (from Mezza Norte, a night food market in QC), not sure if the owner's from Ilocos though, but it's the same as what you have here, orange-y and all...hehe! Juandefulpinoy, ako nga rin eh, wanna eat right now, pero yung Vigan Empanada naman ngayon, yun ang malapit dito eh, hehe..
Tal, Sa lasa magkaka-alaman kung talagang genuine Ilocano yan, kung may chance sana akong mag-taste niyan let me do the verdict, hehe. I wonder why there's so much great foods in Ilocos and I have tried this before and it's really tasty. I still have Bagnet and Vigan Longanisa (which I had for breakfast today) as my favorite foods. @Franc, I swear, Ilocos has more to offer! I have tried Ilocos empanada once and really fascinated by the difference with the ordinary empanada. I tried it only during the Aliwan Festival at CCP in one of the booths. Definitely the Batac ones would taste better. 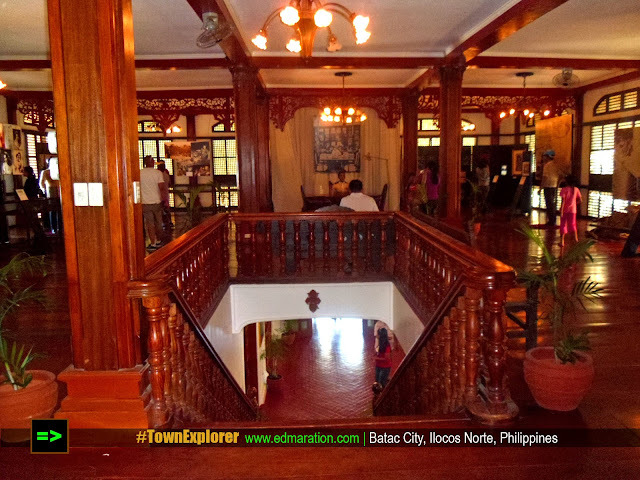 Hope to travel in Ilocos and taste their version of empanada! Gusto ko tuloy ng empanadas!!! Wow. Those emapanadas looks nice. Love the color of it as well. 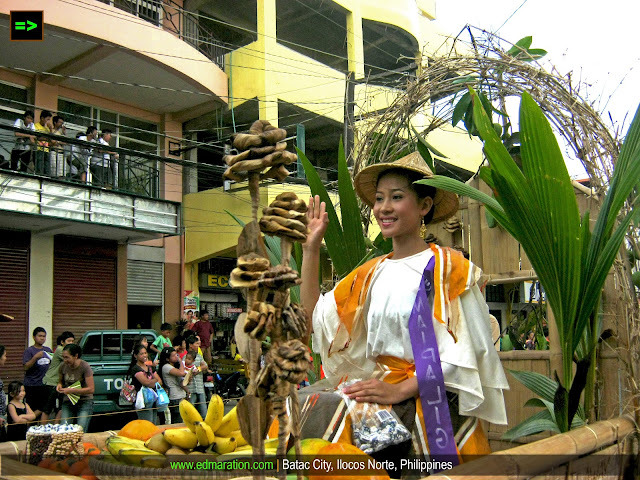 Waaaaaaa...picture pa lang masarap na...kailan kaya ako makakarating ng Ilocos at kailan kaya ako makakatikim niyan? Nakakagutom! I've been a fan of Ilocos Empanada and they all taste really good. 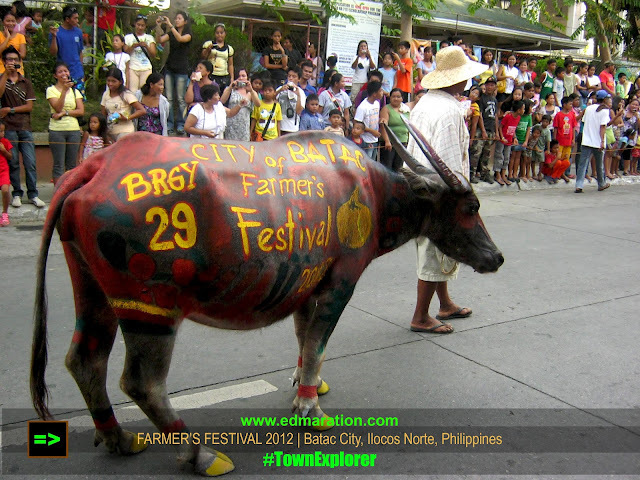 I wonder if it tastes much better when eaten in Ilocos itself don't you think? Sarap nyan... lalo na pag lalagyan ng sukang iloko na madaming sili.